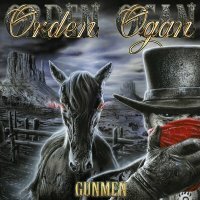 I remember how significant Orden Ogan's last album, 'Ravenhead', was to the band because it was a release that defined their major step up to the bigger league culminating in two huge European tours in 2015 with HammerFall and Powerwolf, not to mention the success of the album in their homeland. Fast forward to now and the stable professional line-up of band leader Sebastian "Seeb" Levermann (guitar/vocals/keyboards) Tobias "Tobi" Kersting (guitar) Dirk Meyer-Berhorn (drums) and Niels Löffler (bass) is still in place after three albums and nearly six years together. 'Gunman' opens proceedings and is fittingly their first single/video with an orchestral key-laden fanfare, heavy rhythms with a melodic guitar refrain and a huge choral chorus sing-along that elevates it to a very memorable status. In fact, I defy anyone after several listens not to be singing along to the chorus! The Western-themed gunslinger in the video is the protagonist Alister Vale, OO's band mascot since their début album 'Vale', and like all previous albums, there is a loose theme of his story running throughout. Of course, anyone familiar with Orden Ogan will well know that their trademark sound is based on hard and heavy rhythms with huge choruses, so in order not to disappoint, Levermann has filled the entire album with enough orchestral magnificence to fill several symphony halls. The huge melodic sing-along choruses crop up all over the place, but particularly in 'Ashen Rain' and 'Vampire In Ghost Town' with its galloping Western-style rhythms. Another feature from previous albums is the inclusion of guest vocalists that Levermann uses from time to time, and for this album he's enlisted the services of ex-Theatre Of Tragedy and former Leaves Eyes vocalist Liv Kristine; her beautiful vocal harmonies are used to good effect on 'Come With Me To The Other Side'. The fast-paced galloping rhythms and huge choral chorus making it a stand out song amongst stand out songs and a video release featuring Kristine wouldn't go amiss. Final song 'Finis Coronat Opus' literally translated means "the end crowns the work" thus "the true value of an undertaking or a work of art cannot be fully discerned until it is finished" – it's epic, Progressive, anthemic, partly sung in Latin and full of swirling synth and guitar melodies, and as such serves as the prototypical song for the entire album.